Evan Cutts, Boston native and BFA candidate at Emerson College. Photo by Alex Fort at Project Poetry’s Unapologetic Pt. 2, hosted at the Dorchester Art Project. Evan Jymaal Cutts is a 22 year-old Boston native. He appreciates Black joy and art wherever he happens upon it & will tell you Anis Mojgani is one higher being’s gift to humanity, then cite/recite six-seven-eight-nine-ten poems to prove it. He believes the key to change is imagination, empathy, and action; that your story is a unique one worth listening to. 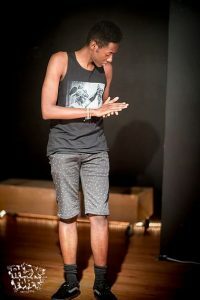 He stumbled upon the Boston Poetry Slam after a meaningful Google search in the summer of 2013, the same summer he spent learning about the Nichiren Buddhism with Sokka Gakkai International (ask him about it). Evan is a BFA Poetry candidate minoring in Africana Studies at Emerson College. His poetry explores aspects of Boston, Blackness and its magic, and is moving towards a global perspective following his recent travels to South Africa. He is a 2016 Best of the Net Anthology nominee and his work can be found online at threelinepoetry.org and voicemailpoems.org and projectpoetry.org.